Like all sound mixers, the Ui24R allows you to create groups of channels – so that they are easier to manage. Read this table as the rows; so an FX Send can contain inputs and sub-groups. Inputs are the physical XLR inputs 1-20 plus Line 1 and 2 and Player 1 and 2. They are only groups to the extent that you can link adjacent pairs for stereo. Sub-Groups contain and combine audio signals both for level control as a group, but also allow you to apply EQ, Gate, Compression and FX to all channels in the group at one time. There are four FX Sends; each one can be assigned an effect eg delay, reverb. This is the return for all its FX Sends. An FX Master is stereo by default. There are eight Aux Sends; each a separate physical output from the mixer. Every Input and FX Master channel goes to all eight Aux Sends but sound is only passed to a Send if the fader is raised for the channel In the Aux Send view. An Aux Send can be paired with an adjacent Aux Send for stereo. Grouping a mix for monitor purposes – so a musician hears then channels they need. A Matrix is a special Aux Send and can best be described as a mixer inside the mixer. In its most simple form, a matrix takes a selection of inputs (usually derived from the group and main output buses) and allows routing of those signals, complete with level control, to a series of outputs. A Matrix can group Sub-Groups and Aux Sends, and can be paired with another Matrix for a stereo pair. VCA groups act merely as a way to control the level of all channels assigned to them with a single fader. Relative channel volumes within the VCA can still be adjusted and the VCA will simply keep any mix level changes made to the channels. A VCA can contain Inputs, FX Masters, Aux Sends and Matrixes, but not Sub-Groups. Grouping channels for easy management during a performance. These are used to show selected channels on the screen at one time. There are six View Groups. To assign channels to a View Group click and hold on the View Group in the home panel. Any channel can be assigned to any number of View Groups. 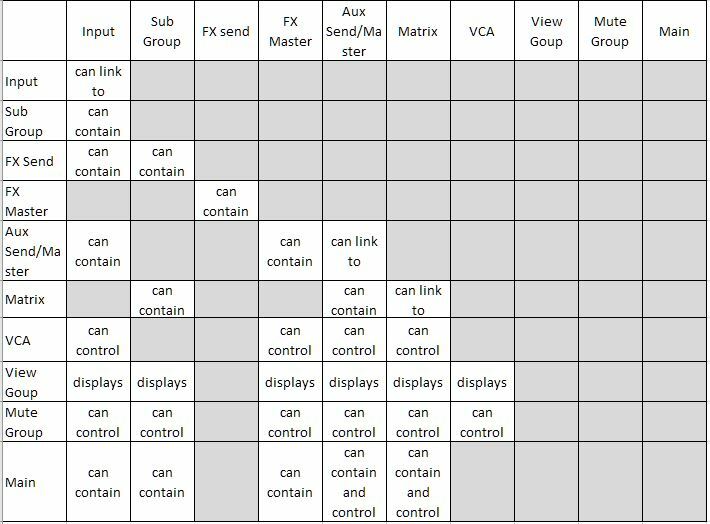 A View Group can display Inputs, Sub-Groups, FX Masters, Aux Sends and Matrixes and VCAs. Note that View Groups are stored per device and as cookies. If you want to save View Groups then go to the Settings page, scroll down and save your View Groups so you can load them into another device or back to the same one. They are not stored with Shows or Snapshots. These are used to silence selected channels with one click. There are six Mute Groups. To assign channels to a Mute Group click and hold on the View Group in the home panel. Any channel can be assigned to any number of Mute Groups. A Mute Group can control Inputs, Sub-Groups, FX Masters, Aux Sends, Matrixes and VCAs. The Main – the Master – channel, a stereo pair – contains the mix to go to the PA system. The Master can contain Inputs, Sub-Groups, FX Masters, Aux Sends and Matrixes. The function of selecting which physical input appears on which channel in the mixer is handled by ‘patching’. The same physical input is normally sent to one channel but channels can be set to take input from the same physical input. Note that some settings are Global (available to all devices using the Ui24R) but others are Local – so one tablet can see them but not a laptop. To share settings, eg view groups, go to Settings – Local Settings, scroll down and select the ‘Local Settings Presets’ Button – Save under the name “Ron’s View groups” (for example). On your other device, go to Settings – Local Settings, scroll down and select the ‘Local Settings Presets’ Button – Load the previously saved local settings preset and voila, you have your viewgroups on the other device.